1. Patek Philippe Platinum Black Watch: Because you always want to tell them what time it is. 2. 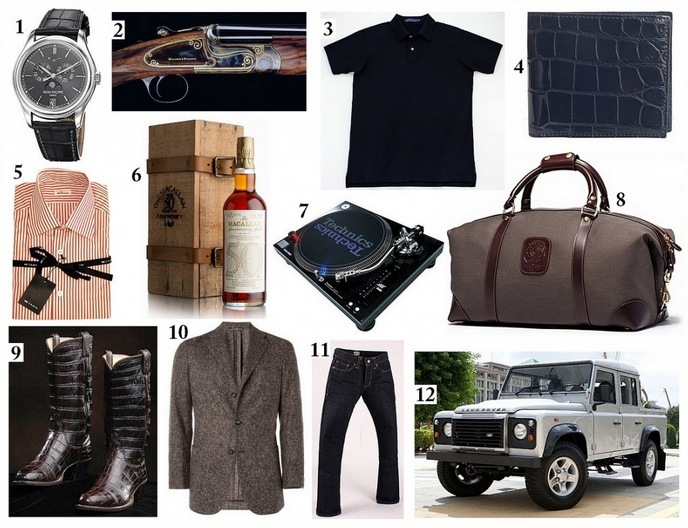 Holland & Holland Shotgun: James Bond used a Holland & Holland; so should you. 3. KP MacLane Black Polo Shirt: As soft as it gets. Doubles as a pajama top. Thank me later. 4. Fendi Crocodile Billfold Wallet: Not that you carry any cash – but a great place to store all your cards and the like. 5. Kiton Napoli Dress Shirt: Go ahead and add another to your collection…along with a Tide pen (you know, just in case). 6. Macallan 50 Year Single Malt: You need something to drink out of your red solo cup. 7. Panasonic Technics Record Player: MP3s are overplayed. Vinyl is where it’s at. 8. Ghurka Cavalier III Duffle Bag: Pack it all in. 9. M.L. Leddy’s Full Alligator Custom Boots: Tell everyone that Troy yelled ‘Choot’em’ at these prior to adding soles and heels. 10. Brioni Donegal Tweed Blazer: Lots of pockets – use it like a work coat. 11. Naked & Famous 25 oz. Selvedge Denim Jeans: Essentially bulletproof. You won’t feel a thing. Or be able to bend your knees. 12. Land Rover Defender 110 Double Cab: The Uber app gets old. Pile in. This article was originally posted on the Red Clay Soul website with the title, “RCS Gift Guide Part Three: Money“, on December 18th, 2012.